Onion Fritters – All the taste of an onion ring in a simple to make little fritter (pancake). These are great as a side dish or as a fancy appetizer! I love onion rings. But there’s no way I’m going to make them at home. I don’t deep fry anything here. And the idea of dunking all those onions just tires me out. That’s where these onion fritters rock! All the taste of an onion ring in a simple to make little pancake. That’s right, these taste just like onion rings. So good! And you can make them ahead and serve them when you’re ready. Just keep them in a low oven (like 200 degrees F) for up to an hour. Though I do like them best when they are hot out of the skillet. If you can find it, do yourself a favor and get the aluminum free baking powder. At first I didn’t think there was a difference between regular and aluminum free baking powder. But, I can totally taste the difference; the aluminum free baking powder tastes so much better to me! Here’s my Affiliate link for Amazon so you can see some options for aluminum free baking powder. I call for hot sauce in the recipe. Use your favorite. Mine is Sriracha. I love that stuff. A little sweet. A little spicy. Not too hot. Not vinegary in flavor. But if you prefer another kind, by all means, use the one you like the most. As for the milk in the recipe. I’ve only used whole milk, but I’d be willing to bet that a plant-based milk will work just fine. That simple substitution would make these Onion Fritters vegan. But, again, I haven’t tried it; let me know if you do. All the taste of an onion ring in a simple to make little pancake. 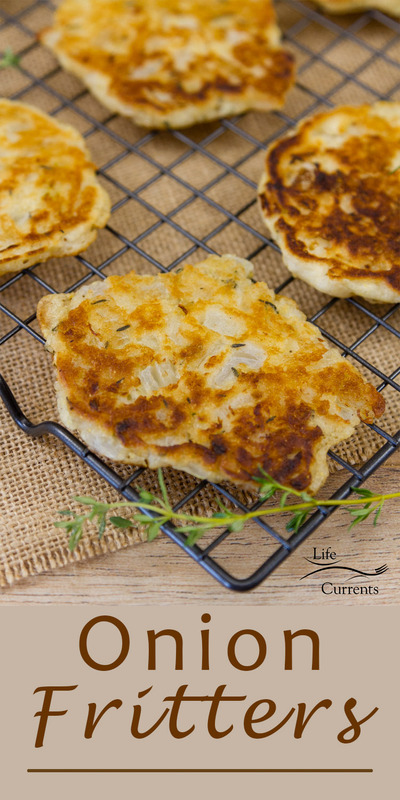 These are great as a side dish or as a fancy appetizer! Combine flour, cornmeal, sugar, baking powder, thyme, and salt in a large bowl. Stir milk and hot sauce into the dry ingredients. Add the chopped onion, and mix thoroughly. Keep fritters warm in a low oven, about 200 degrees F while you fry the rest of the batter. Serve warm, plain or with sour cream for garnish. I LOVE this idea!!!!!! Must try!